Obituary – Fitzhugh, Thomas LaVaughn « Perry High School Alumni Association, Inc.
– an active part in nearly all PHS activities has featured the high school career of Thomas LaVaughn Fitzhugh, who graduated this spring with the class of 1943. Tommy was born 18 years ago in Trenton, MO., but has made his home in Perry for 17 years. His father is E. E. Fitzhugh of 1009 Fir street. Tommy has attended no schools other than Perry’s and was a Boy Scout for three years. He is president of the speech class, president of the band, and has served as homeroom vice-president, football queen manager, class reporter, and was a member of both the junior and senior class play casts. Fitzhugh, a basketball letterman, played football and was with the Maroon band as bass drummer at the Enid tri-state band festival this year. Following graduation he plans to enter either the army or marines. Pfc. Thomas L. Fitzhugh, 20-year-old son of Earl Fitzhugh, 603 1/2 Delaware, died of wounds on Okinawa June 13. Private Fitzhugh was wounded in action June 1, according to a telegram on June 29. 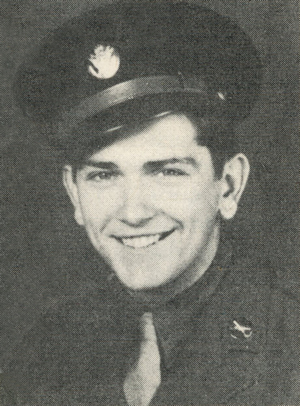 He entered the army in June, 1943, shortly after his graduation from Perry high school. After a few days at Fort Sill he was sent to Camp Roberts, Calif., for 18 weeks’ training. In November he was home on furlough before going to Fort Ord. Calif. From Fort Ord he was sent in December, 1943, to Hawaii for six months training. He saw his first action on Saipan, and spent some time in the New Hebrides before going to Okinawa. He was a member of Company “K” of the 165th infantry. In high school Fitzhugh participated in the band, basketball and football, as well as being in both the junior and senior class plays. Survivors, in addition to his father, include two sisters and two brothers, Mrs. Helen Weldon of Oklahoma City, Mrs. Opal Van Now, Baltimore, Md., Cpt Elza Fitzhugh, Fort Bliss, Texas, and Olin Fitzhugh, in Florida.